Long have I appreciated the obfuscation of reality brought forth in abstract art. As a kid, I was drawn to it. It’s careful, but it’s not too careful. 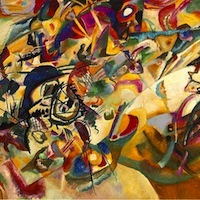 The father of abstraction, Wassily Kandinsky, was a synesthete. He, like few before him and John Burke after him, sought to evoke sound through vision – pitch through color. His abstract paintings are pleasantly intricate and (perhaps literally) resounding. He was a pioneer, a teacher, a cellist, a painter – the quintessential artist. And, again, dear Wassily was a synesthete. Above-left is pictured his Composition VII, painted in Munich, Germany in 1913. Colour is the keyboard, the eyes are the harmonies, the soul is the piano with many strings. The artist is the hand that plays, touching one key or another, to cause vibrations in the soul. I saw all my colours in spirit, before my eyes. Wild, almost crazy lines were sketched in front of me. A young Wassily is said to have heard a peculiar hissing sound when mixing different colored paints in his childhood paintbox. From what I can gather, this man was indeed an authentic synesthete. He evidently had quite the imagination; this, however, was not a figment of unreality. Read more about Kandinsky’s experiences. It’s clear that this man saw more in color than the common man or woman. To him, color was more than a quality of an object, more than an adjective. Color had its own meaning, its own depth, its own purpose in our world. His description of his favorite color, blue, included “it calls man towards the infinite” – a spiritual reference, no doubt, but an honest perspective, I believe. It’s difficult to put yourself in Kandinsky’s frame of mind. It’s neat to think about, though. Let’s give it a try. Think about your favorite color, be it Tomato red, Holly green, Sienna orange, Caribbean blue, etc. Beyond its appearance, or how it appears when manifested physically, what does it mean to you? What does it represent? What is its purpose? If I get some good responses, I’ll chime in with my thoughts on black, which isn’t as much a color as it is a shade, but it’ll do. Don’t be shy, people. Synesthete or not, I’d love to get some abstract thinking going. Do it for Kandinsky! Leave your comments below, and I’ll respond promptly. 🙂 Check out some more of Kandinsky’s artwork here.